Welcome! I have enjoyed participating in the Blogger's Quilt Festival tremendously over the last year and I have been looking forward to its return. This year we can select 2 quilts to enter which somehow made the choice even more difficult. This Improv Circles quilt was really the first time I have just picked up the fabric and my rotary cutter and started making something. Generally my process involves a lot of thought, a lot of Flickr perusing, and plenty of indecision. It was so fun to just go somewhere unexpected with this quilt. When I started working on this, I intended to make an entire throw size quilt. But by the time I made a few blocks I knew that I wanted this to be something that I could see every day. Thanks for stopping by, I am looking forward to checking out the other quilts that are shared in the festival! WOW! That's beautiful! I love the straight line quilting! 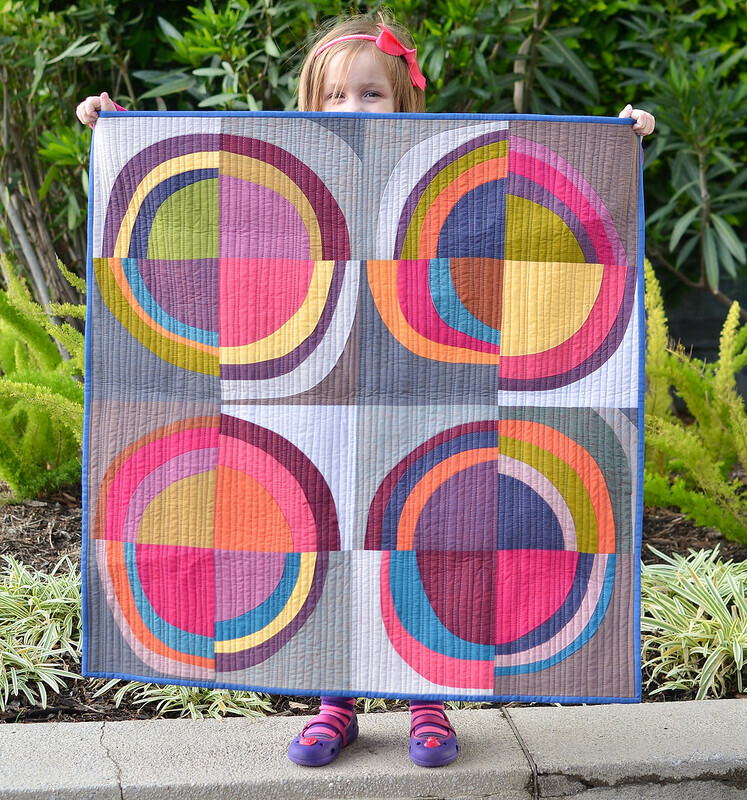 I love these improv circles and your colours are gorgeous! the circles are spectacular! the quilting sets them off wonderfully too. Me again! And I love this one toooooo. One of my favourites for sure, Erica! Love it. Love the quilt and the smiling quilt model! Love the improv piecing, the effect of all the quarter circles together is really cool! It is an amazing quilt. I would like to look at it every day too. Oh, wow! This is awesome - great fabric choice for improv curves... Beautiful. Great combination of shot cottons and curves! The best of both worlds! Gorgeous! I can see why you'd want to look at it every day. I would too! This is just lovely. Gorgeous colors. Really lovely! The colours and varied background, the curves and straight lines of the quilting. I see why you wanted to see it each day! i love the colors! but i especially love your helper in holding the quilt up. so cute! LOVE this quilt!! Is there a tutorial on how you made this???? Holy moly, I love this! Just stumbled across your blog today and I'm captivated by this stunning quilt.